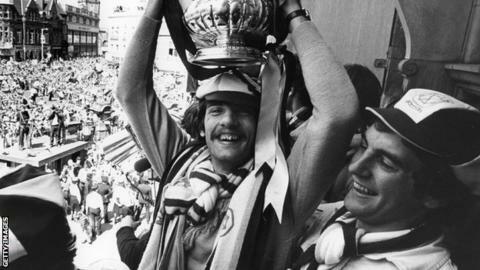 The FA Cup made Alan Devonshire a hero. It also broke his knee and, with it, his heart. A Wembley winner with West Ham in 1980, he went on to snap tendons during a third-round tie four years later. The time, place, date; they are burned into his memory. "January seventh, 1984, seven minutes into the game, at home to Wigan. It's there," says Devonshire, now 58, gazing down towards the beer-stained floor of the Braintree Town supporters' bar. "I was in a bad way and in hospital for five months after that. I lost two stone and there was nothing of me anyway. "They were dark times but it makes you a better person. I know I could have had a better playing career if I hadn't smashed my knee up. "I was playing my best football at that time. It's the only regret I have in my life, that one moment." On Sunday, Devonshire's Conference side Braintree Town host League One Chesterfield in the same competition that brought the former England international his most crushing low, as well as his most delirious high. And by the time this season's final rolls around, it will have been 35 years since a West Ham team containing Devonshire, Trevor Brooking, Frank Lampard Sr and Billy Bonds upset Arsenal in front of 100,000 at Wembley. John Lyall's Hammers, a Second Division side at the time, were there courtesy of a 2-1 semi-final replay victory over Everton, in which midfielder Devonshire scored. He was worshipped for it. "I'm a 23-year-old boy and there's men in their 40s crying with joy, wanting to get hold of me and kiss my feet. It was scary at the time," he recalls. "But to think you've given them that pleasure it's worth it. I'm lucky that people still talk about games I've played in." Brooking went on to score the only goal in the final, and it remains West Ham's most recent piece of major silverware, as well as the last time a team from outside the top flight lifted the trophy. "Most of us went to the dogs the night before at Wembley. We all won a few quid," recalls Devonshire. "Driving through Newham on the Sunday was unbelievable. That will probably stick with me more than the game. There must have been getting on for half a million people there, just lining the streets." Devonshire's surroundings are far more serene these days. On this particular Tuesday night, the hordes of Hammers fans were replaced by 873 ardent Braintree supporters, braving a crisp November night to sit through a drab 1-0 Conference defeat by Grimsby. The '80s were a different story altogether. "The best time to be alive," says Devonshire. He was a player in his pomp, at least until the knee injury midway through the decade which would deprive him of almost two years of his career, and almost certainly restricted his number of England caps to eight. But while Devonshire retains a special place in the collective hearts of Hammers fans, he is winning over new admirers in north Essex. Handed the reigns of newly-promoted Braintree in the summer of 2011, he has successfully kept the part-time side in the Conference with a tiny budget and just two training sessions a week - often just one if there is a midweek game. The Iron's squad is transient season to season, with one-year deals for youngsters who have been filtered out of professional academies. Last season, remarkably, after playing 12 games in two weeks during April, the Cressing Road outfit finished three points outside the play-offs. It was the best season in their history. Maybe that success, the ability to punch above their own weight, owes something to Devonshire's empathy with his players. Released by Crystal Palace as a teenager, Devonshire played for non-league Southall while working as a forklift truck driver at the Hoover factory in west London, before being picked up by West Ham. "I was a late developer myself. Just because one person doesn't like you or rate you, it doesn't mean you're not good enough," he says. "We'll give young boys an opportunity if they're good enough. Attitude is a big thing here. We won't have any big-time Charlies. I've got talented footballers." The Iron go into Sunday's tie after a rotten run, having gone eight games without a win, but the prospect of a first appearance in the second round awaits if they can beat a side 41 places above them on the football ladder. It could well be a stage for Devonshire's kids to sell themselves - and even for the manager himself, who has won promotions with Maidenhead United and Hampton & Richmond Borough, but is yet to get the call for a Football League job. "If it happens, it happens. If it don't, it don't. I know I could do it, but at the end of the day I'm getting older now," he asserts. "I've got to be careful what I say here - but it's not what you know, it's probably who you know. Maybe I am unfashionable? "And that's disappointing. It should be on your record of what you do. I'm quietly pleased with what I've done." A Cup upset on Sunday, and the Hammers hero may become impossible to ignore.